I have seen this in one of the ubiquity controller software and used it. It allows to use the AP as an RF scanner and displaying occupation of different Wif bands and channels. I was able to use this feature to find out that in channel 1 (2.4Ghz) there was considerable distortion of a non-wifi source. 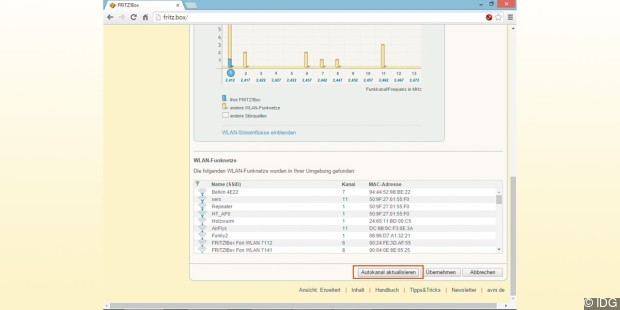 Implement Wifi scanning of visible and non-visible networks (beacon frame) visualising the different frequencies. If possible include the results of the RF scan, non-wifi occupation if anyhow feasible. This would be incredibly cool and make our lives SO much easier. 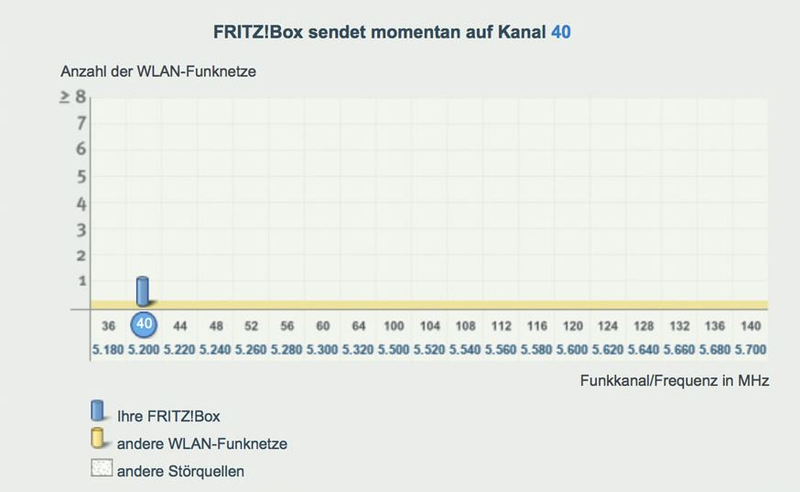 this is even implemented in consumer APS like Fritzbox, so why not in a pro AP ? When the devices are not able to do it I often use some App on my Android to do it. 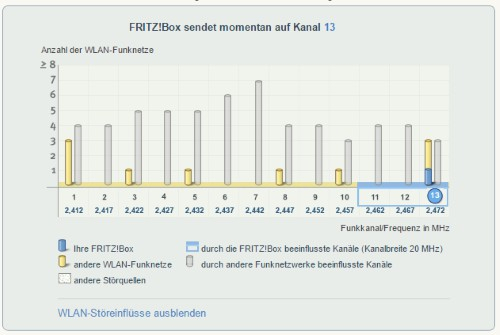 I'm interested about Fritzbox feature, do you have a screenshot or link to that? The problem with scanning with phones, is that you can only see the quantity of BSSIDs, there is no information on the channel occupation or freqency noise. I think what the post creator meant is something similar to an spectrum analizer. Unless, your tool is something I've mention that works on a phone, I'll definately go for that, professional spectrum tools are pretty expensive. Thanks for the screenshot, do you consider the grey bar as noise levels? or is there some other way to interpret? googleing the wording it says channels influenced by other radio networks, but it's not specific in defining what is "other radio network", theres already a yellow bar so I'm thinking it could be signals that are unable to be identified that is "noise" to the AP.